The date code suggests it’s been in the fixture for over a decade, so I can’t complain. Having two unrelated bulbs fail within a week, after years of service, is surely coincidence. If another fails within a week or two, however, it will definitely be Enemy Action. This entry was posted on 2017-11-12, 07:16 and is filed under Electronics Workbench, Home Ec. You can follow any responses to this entry through RSS 2.0. Both comments and pings are currently closed. If you changed them all over to CFLs at the same time, then they are likely to all fail at about the same time. I’ve noticed that CFLs tend to have similar lifespans. We redid the basement lights (replacing scattered tungsten bulbs in ceramic sockets with fluorescent tubes / CFLs) late in the last millennium, just after we moved in, so all the fixtures have seen at least one bulb and I’m now deep in random failure territory. Back in the day, I didn’t know enough to notice how the CFLs failed; maybe they’ve always gotten scary-hot! I have 23W CFLs in sockets along the trusses in the barn. One is near the access point to the mezzanine above the workroom. The base gets too hot to touch, but I can’t recall any hot failures like what you’ve seen. I do have a 23W bulb in a glass dual-bulb fixture that’s getting the end of life flicker. Have to take a look at it. Note to self: look at higher wattage LED bulbs. I could use some 1600+ lumen ones. Because CFL ballasts are integral with the bulb, I think that the unit as a whole is particularly heat sensitive. As I said before, applications where heat is concentrated tend to burn them out fairly quickly. Fluorescents generate less heat than incandescents, but they do generate some and I am pretty sure (although I haven’t seen any test data) that the ballasts start heating up as they draw close to the end of life and that accelerates the process. I have seen some that are charred by the time they burn out. At the university we have switched to LEDs for most of our can lights–Home Depot sells a stick-style bulb that is equivalent to a 23w CFL or (I think) 100w incandescent. Those seem to be working out well, it’s a nice cool-white spectrum light and they remain cool enough to touch with a bare hand even in metal cans. I must autopsy the bulb to expose the horrors lurking within! A couple of years back, the local power company subsidized 7.5 and 9.5 W LED bulbs, and we bought a bunch. I swapped the CFLs in the house for LEDs, gave our 13W new stock away, and kept the 13W takeouts and the 23W new stock. The barn/shop is a bit dim, and I’m looking to add strip lights and some LED spot/floods in the trusses. These are 14′ up, so it’s a tricky job. Mercifully, after the power company did a new substation nearby, the loss rate on the bulbs got a lot better. Now it’s 1 of 6 per year or better for the open bulbs. Worse for the ones in glass fixtures, but those are easy to reach. When power was really iffy, I was losing CFLs rapidly. Haven’t lost an LED bulb yet. Oh yeah, CFLs hate vibration and shock. Tried one as a worklight on my mill-drill; lasted a couple of minutes when I was milling. Similarly, the LED bulb in the garage door opener seems perfectly happy. It’s outlived the most recent “rough duty” incandescent and maybe it’s the last bulb I’ll ever install out there. Please do! 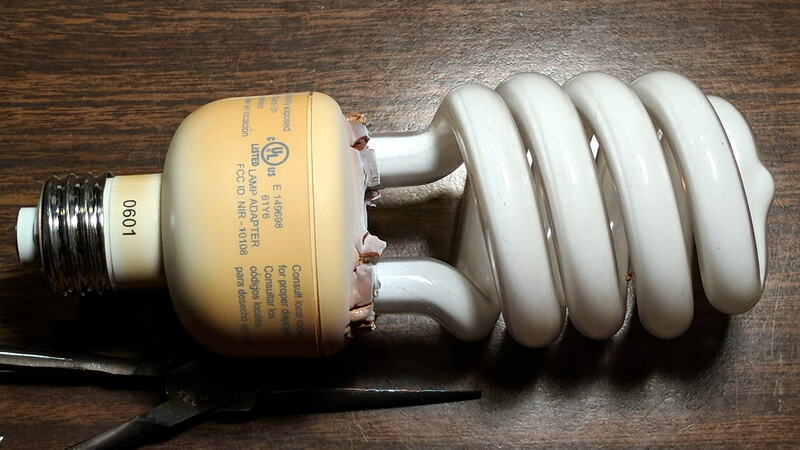 If you could dissect a CFL base and document the innards I’d consider it a great service. I expect it’s just an electronic rapid start ballast jammed into the base, but I’ve had the time to take one apart. We are in the process of relamping the exterior lighting with LED fixtures and I highly recommend it. If you’ve ever replaced an HID ballast while 30ft up a wall on an extension ladder, you will love working with high lumen LED fixtures for exterior lighting. There are replacement wall packs as well as bulbs designed to replace standard and mogul base bulbs–you just pull the existing ballast and screw in the bulb. Recently we added a new parking lot with a hundred something spaces and the exterior lighting is 8 or 10 poles fitted with LEDs. The light is comparable to HID metal halide or sodium vapor lamps (in my opinion the color spectrum is more natural than either) and lighting for the whole lot is on ONE 20 amp breaker. Ten years ago we would have put in a new panel with a separate circuit for each lamppost. I am by no means a Green apologist, but in the case of LED lighting, the technology is really much better.